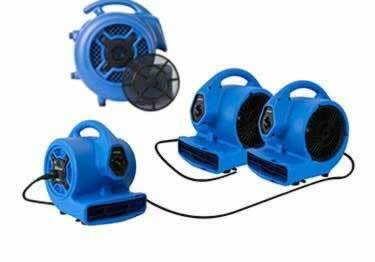 XPOWER''s high quality Air Movers are designed to meet the tough demands of professionals in the water damage restoration and cleaning, janitorial, and sanitation industries. Powerful XPOWER Centrifugal Air Movers have a fully integrated motor, housing and parts design which provide maximum efficiency, performance and balance. The 400 and 600 series models are ETL/CETL safety certified. The 400 Series is a reliable air mover that works quickly and efficiently. It can be set in 4 different positions - 0, 20, 45, or 90 degrees. The 600 Series is designed to serve the water damage restoration and janitorial carpet cleaning industries. These air movers have a stackable, compact design. The 800 Series is the most powerful of the XPOWER Air Movers. Professional, industrial strength design with injection modeled housing materials for long term performance and durability. Capable of drying large areas in minimum time.